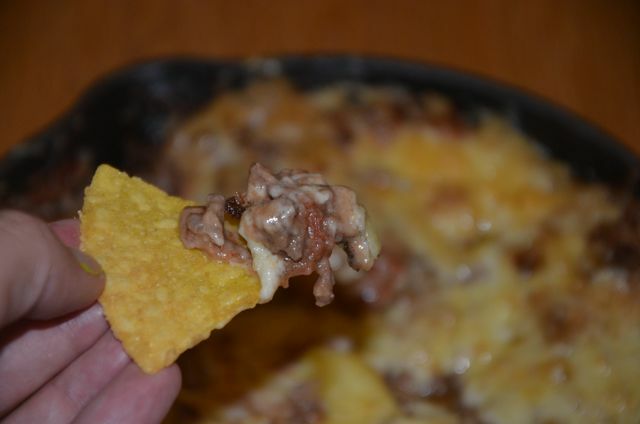 Sometimes nothing will do but some delicious, gooey nachos and this is one of my favorite ways to serve them! I'm not crazy about soggy chips, I'm a big fan of dipping and I like the personalization of doing them this way… For example, some people want a lot of meat & cheese, some people only want a little. Some people hate hot sauce, while some people devour it. Either way, there are some options for customizing here to suit people's varying tastes and a few items that can be added on the side for a truly personal nachos experience. Serve this on the table with chips on the side for simply dipping or offer guests a selection of toppings such as hot sauce, sour cream or sliced jalepeños in addition to the skillet to spoon into bowls full of tortilla chips. The choice is yours and it tastes great either way! I will totally make these for Friday night dinner, but they're also great nibbly food for a party. However you choose to serve them, they're best enjoyed piping hot, but they're not bad after cooling down a bit either. 1. Preheat the oven to 180°C. 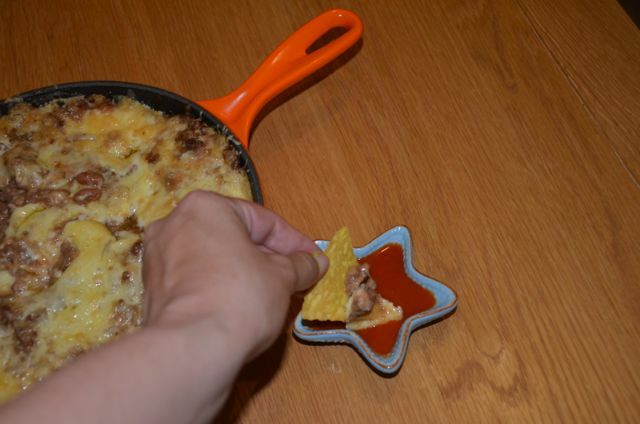 Spread the tortilla chips in a single layer across a cookie sheet or two. Sprinkle 1/4 of the cheese across all the chips. 2. 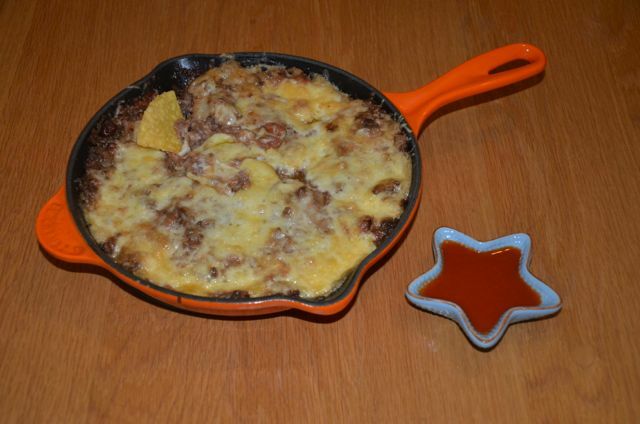 In a large, oven-proof skillet, cook the ground beef over medium heat until browned. If the skillet you're using is cast iron, you may want to add a tablespoon of oil to the skillet before the beef to prevent sticking. 3. When the beef is browned, stir in the cinnamon, cumin and chili powder and allow it to sizzle for a minute or so before stirring in the beans and passata. Reduce heat and allow this to bubble away on low for about 5 minutes or until warmed through. 4. 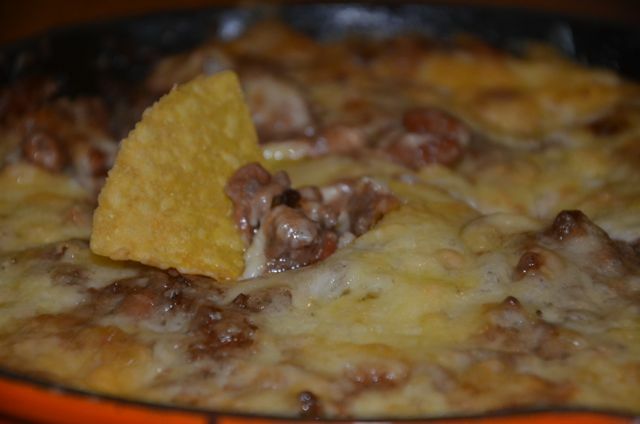 Stir half of the remaining cheese into the beans & meat mixture, then sprinkle the rest on top and bake in the oven along with the tortilla chips for about 10 − 15 minutes or until nicely melted and bubbly and the cheese on the chips is melted. If you find the chips are done before the meat, that's fine - remove them earlier. 5. Serve alongside desired accompaniments such as hot sauce, jalepeños, sour cream or your favorite salsa.